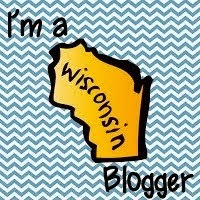 Part 4 Equals Math- The lesson - All Things Special Ed. Equals Math Program comes with 12 units or what they call chapters. Each chapter is numbered and has a theme (ie home). The example I am sharing is labeled 3-B 3. We are in chapter 3, the letter (B) represents the section (depending on the unit, it may have sections A-E). Then the circled number represent the number lesson for that chapter and section. (See picture #1 below.) The lessons are organized in the same format so planning is easy. Depending on your students, one lesson could take you a number of days. Equals gives you a suggested pacing guide based on your student(s). Of course, individual student needs will dictate your pace and you can adjust as you need. Also, feel free to return to lessons in which mastery was not yet achieved. Currently with my Equals math groups, I am pacing my lessons on a Level 2. Each lesson has the same set up and is divided among four pages. The first page is called, "Getting Ready" (see page 1 picture above). This first part of the lesson is to review skills previously taught. This is the only page that is optional and should be used as appropriate to your students' needs. 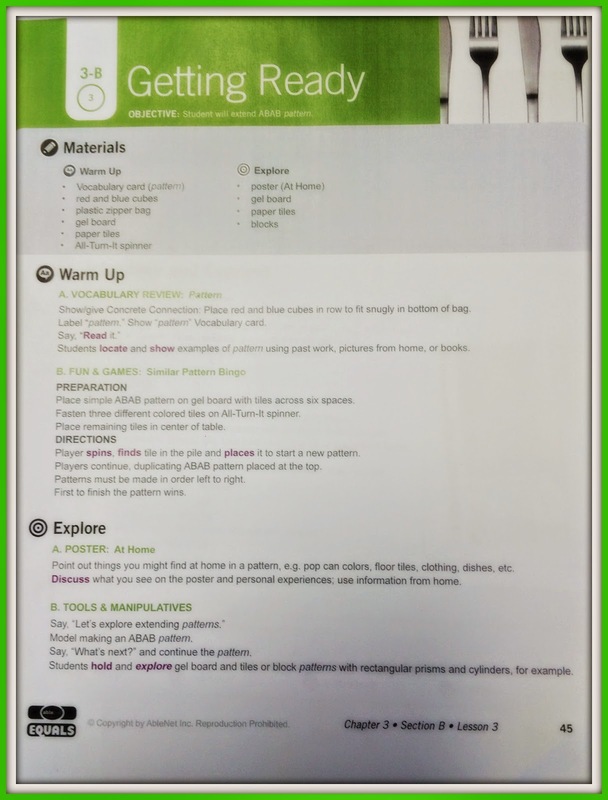 The lesson materials for "Getting Ready" are listed in the gray section and you may find: cards, posters, manipulative kit and items to print/project from the Teacher Technology resource on-line page. This first part of the "Getting Ready" lesson is called, "Warm Up." You will first complete a "vocabulary review" and then move onto "fun and games". The vocabulary review has been previously taught, with the exception of the very first lesson. For fun and game, these are activities to review a past skill in preparation for the new lesson objective. The second part of the "Getting Ready" lesson is called, "Explore." You will first look at a poster and give students the opportunity to see what your student know about math and the environment. The second part is called "Tools and Manipulatives" where the teacher provides a simple demonstration to the student(s), then the students are allowed to hold, try, manipulate, and explore the materials. For my level 2 group, I complete all these activities on day 1. The 2nd (and 3rd) page is the the actual lesson, see picture above. This first page will state the objective. For example, in this lesson the objective is: the student will extend ABAB pattern. The top shaded area gives you the list of materials you will need to gather before teaching and for which part of the lesson. This page is my day 2 of teaching this math lesson and is called "Introduce and Connect." There are 3 parts to this that you will teach called: Explore Poster, Show & Tell, and Vocabulary. Explore Poster: The poster is used to introduce and reinforce the math concepts. Show & Tell: This is a teacher lead discussion about what the students know about the new topic. Vocabulary: Show the vocabulary words card and define the word for the students. The students will have practice saying the word and definition. 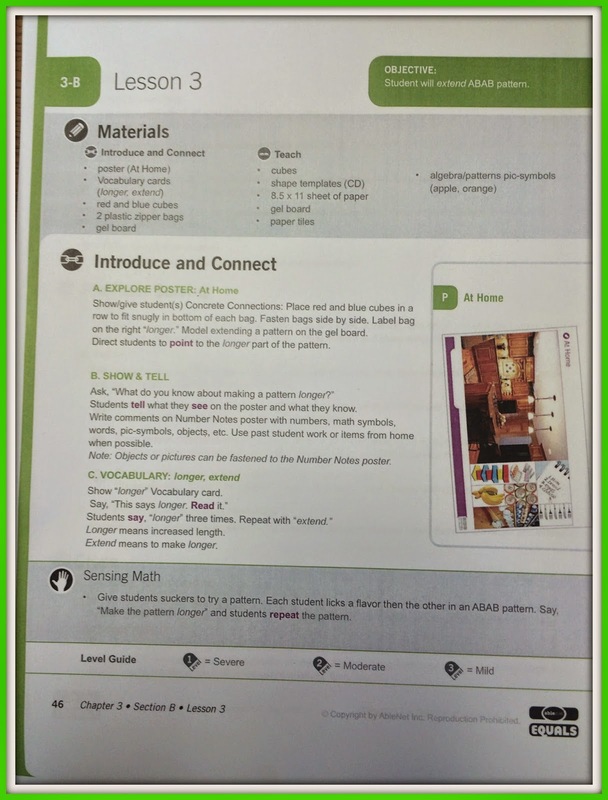 The last part on this page is called, "Sensing Math" and is an optional activity. I try to always do this activity. "Sensing Math" gives the students practice through the 5 senses. The 3rd page is your second part of the actual lesson and I teach this on day 3 and 4 (see picture above). This page describes the teaching method of CSA used in each lesson. Then is the skill drill practice time followed by the problem solving activities and finally the close. The skill drill and problem solving can be done individually or in small group. After demonstrating the CSA, students try out the new skill (worksheets) before it is applied in a word problem. There are 3 levels of worksheets (1, 2, or 3). Typically I have used level 2 but if I notice a student struggling or they quickly grasp the concept, I will print out a different level for them to practice with as well. The next part of the lesson is "Problem Solving." The lesson objective is presented in the format of a word problem and the teacher demonstrates with student input. Then you move on to the "Solve It" part of the lesson where students get a change to work on their own word problem with support of the teacher and/or peers using hands-on materials; you will notice the 3 levels you will need to choose from, with your student/group. The end of this part of the lesson is called, "Close." In the :Close: section you complete two parts, "Show Me" and "Number Notes. The "Show Me" section is where the students show their teacher and peers what they know by showing a worksheet, using the materials or through a verbal explanation. You may use this as an informal assessment to help you guide you in your follow up activities. Finally it is time for the "Number Notes" part of the lesson, where the teacher models writing the vocabulary word and the students write (or use pic-symbols) on their Number Notes page and can provide examples and the definition of the vocabulary word. This is done on day 3 and 4. Day 4 we also work on the workstations if we have time which is provided on the next page in your lesson. 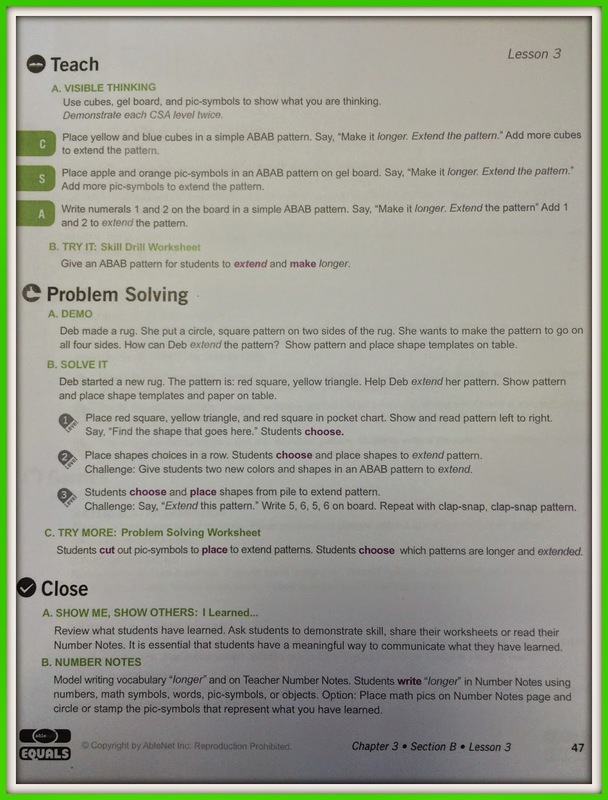 The 4th page labeled, "Follow Up" is a page with each lesson that provides students the opportunity to apply the math skill in everyday activities. This is the last day of my lesson, day 5. It also provides added practice and enrichment of the math skills. There are three parts to this section: Real Life Problem Solving, Workstations, and Games. 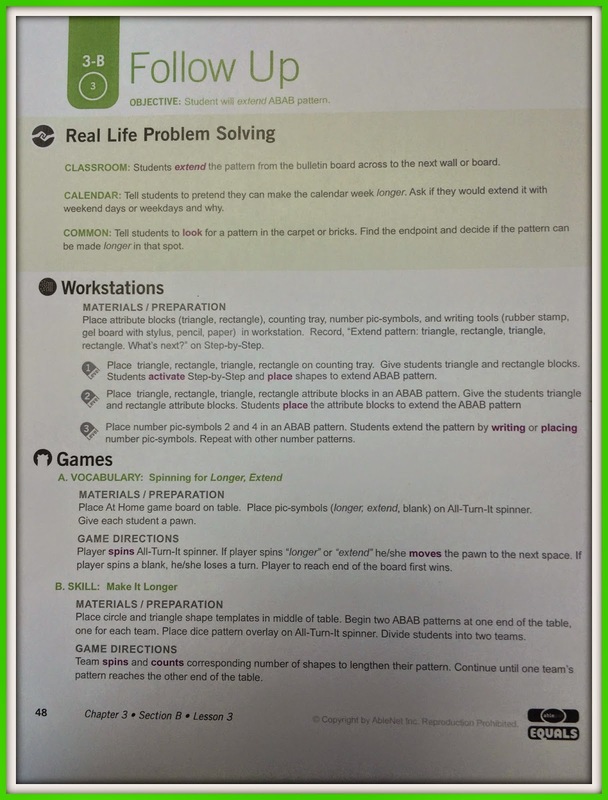 Real Life Problem Solving: students practice and apply their math skill with classroom tasks, calendar work, and common areas where it connects math to transition times within the day such as waiting in line for lunch, walking down the hallway. Workstations: provides independent practice or enrichment opportunities for individual or small groups and each workstation is provided with the 3 levels to meet all your students needs. Games: vocabulary and skill games are provided and played throughout the week. That is a LOT of information but I hope it clarifies the lesson format and please feel free to shoot me any questions that you may have. I hope you have a great day!